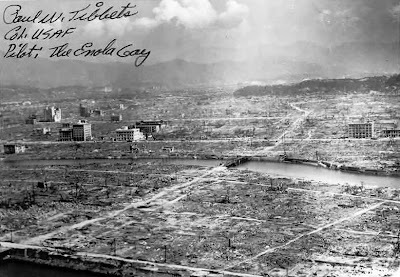 Sixteen hours ago an American airplane dropped one bomb on Hiroshima, an important Japanese army base. That bomb had more power than 20,000 tons of TNT. ... It is an atomic bomb. It is a harnessing of the basic power of the universe. . . . What has been done is the greatest achievement of organized science in history. . . . If the "nuclear age" taught us anything, it's that you can't split something as small as an atom and try to make things whole again. Intelligence isn't the answer either or so it seems. There are powerful lessons to be learned even yet but will we learn? Indeed--and just because we can does not mean we must. But we will--we can't help ourselves. I bumped your comment up into the next post. There may be a good evolutionary reason why few things are as "intelligent" as humans, and humans have not been around very long. Yeah, it's still not up yet. It took longer to send out the proof than I had hoped. I'll create a post for it when it's ready. I hope this is a lesson the world never forgets.